I believe this recipe was probably published in the local newspaper in the early 70's. It's supposed to be from a well-known restaurant in town, The Firehouse, a restaurant that still enjoys steady business and a good reputation. My mother started making the salad in the 70s. It is one of my favorite salads, so I thought I'd share. It is substantial enough to stand alone for a lunch. Or serve it with grilled chicken or pork for a more substantial meal. The curry powder in the dressing is very subtle, not overpowering, and there is a nice balance of flavors. green onion to spinach in bowl. Toss with dressing. Some cookbooks are mere collections of recipes. Others are glossy productions with great photographs and narratives of the country and cuisine they cover. These may or may not have recipes that you can or would like to cook in your kitchen. Some cookbooks concentrate on one ingredient or technique and include recipes that range from the absurdly simple (Peanut Butter Toast) to the ridiculously absurd (Nepalese Yak Shanks Stuffed with Peanut Butter Millet). Each has its own appeal and it is the rare cookbook indeed that has no decent recipe. I find my favorite cookbooks to be written by people thoroughly familiar with the cuisine they are presenting. They are not simply visitors passing through on their way to their next cookbook. They know the landscape, the history and cultural background of the cuisine and can explain why one ingredient might be used rather than another. Patricia Wells and Joyce Goldstein are wonderful in writing about the foods of France and Italy. Diana Kennedy and Rick Bayless obviously have a great understanding and respect for Mexican food and it comes out in their recipes. Although I wouldn't call it a great cookbook, I'm very fond of Sri Owen's Indonesian Food and Cookery. In making the recipes accessible to western cooks she made some questionable choices, but her authority is undeniable. Her fondness for the cooking she grew up with is clear in her writing. These are authors whose books I admire because of their ability to convey the nuances of the cuisine to the reader, not simply compiling a collection of recipes. An author I have increasingly come to admire is Bruce Cost. Several years ago my wife insisted we buy Asian Ingredients while in Chinatown one day. I didn't think we really needed it, but I always listen to my wife. This is a book that anyone who cooks Asian food should have. Its range and depth is astounding, and Cost writes with great clarity. He covers the history and uses of different ingredients and includes a number of unique recipes (Noodles Made from Shrimp with Sea Scallops; Chrysanthemum Leaf and Fresh Water Chestnut Salad). He explains how ingredients are commonly prepared and how they shouldn't be used. Some of the recipes are traditional and others are modern fusion interpretations. It is a book that I find myself going back to again and again to get more ideas and a better understanding of the ingredients I am using. 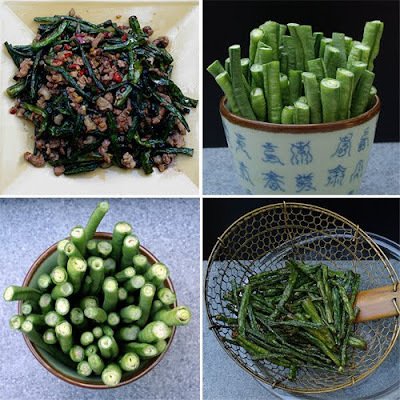 Here is his recipe for twice fried long beans. Cut the beans into 3-inch lengths and set aside. Heat 2 cups of the oil in a wok or heavy skillet until nearly smoking. While it's heating, chop the pork to a finer consistency. Combine the chilies and giner and set aside. When the oil is hot, add the beans (after making sure they are thoroughly dry), and cook for 2 to 3 minutes or until they wrinkle. Remove and drain. Drain off the oil (it may be strained and used again) and reheat the wok. Add the remaining 2 tablespoons of oil and the pork. Cook, stiriing, over high heat just until the granules are broken up and the meat changes color. Add the soy sauce and stir for 20 seconds, then add the chilies and ginger and cook for another 30 seconds. Add the beans, sugar, salt, and wine, and cook, stirring, until piping hot. Serve. What do you look for in a cookbook? What are some of your favorites? I'd love to hear any recommendations you might have. Paper Chef 43--May I have the envelope please? As the winner of last month's Paperchef challenge, it was my responsibility and honor to choose the winner of this month's challenge. You'd think that it would be easy, or at least I thought it would be. Then I looked at the entries, read the recipes and pondered my decision. I was honestly impressed by all the entries and had a very difficult time selecting the winner. All the recipes were successful in incorporating the for ingredients and each had its own slant. Janie's Couscous Cakes with Hot Pepper Peach Reduction looks and sounds delicious, as does Lori's Rosemary Scented Toasted Israeli Couscous Timbales with Chili Peach Sauce . Jenny from the delightfully named I could even eat a baby deer submitted an innovative dessert, Trifle of Carmelized Couscous and Baked Peaches. Mikey entered an appealing Pork Tangine with Peaches and Tricia sent in a Cross-Cultural Casserole. Those were the entries from bloggers. I was very pleased that we also had two entries from non-bloggers. These were also attractive, innovative recipes that I look forward to trying. Yannic submitted a Summer Salad Composed of Couscous Cakes, Peaches and Gorgonzola and Pauline sent in Spicy Couscous Beefburger with Olive and Rosemary Focaccia and Fresh Peaches. Which would you choose? I am sure if you asked ten people you'd get a pretty even split among three or four of the entries depending more on the preferences of the voters than on the dishes themselves. For me, the recipe that best incorporated the four ingredients and appealed to my tastes was Yannic's Summer Salad. 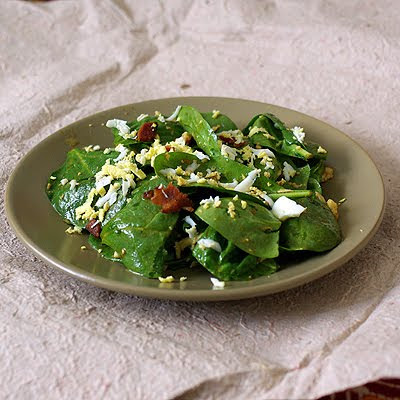 It sounds like a wonderful salad and the Gorgonzola seems like it would really pull the elements together. So I choose Yannic as this month's Paperchef challenge winner. Congratulations Yannic! Thanks again for everyone who participated. All of the recipes really sound delectable and I look forward to trying them out. Thanks also to Mikey of Paperchef for all your work in generating the ingredients list and publishing the round-up. I look forward to next month's challenge. Having started this blog largely so I could participate in the Daring Bakers challenges, figuring that it would give me an excuse to bake more often, I was pleased to discover the Daring Cooks component. I am more fond of savory foods than sweet ones, so I looked forward to trying my hand at the challenges presented by the cooks. There's a bit of delay in being admitted into the inner sanctum of the Daring Kitchen in order to take part in the challenges, so this is my first Daring Cooks challenge. This month's challenge was hosted by Olga from Las Cosas de Olga and Olga’s Recipes. 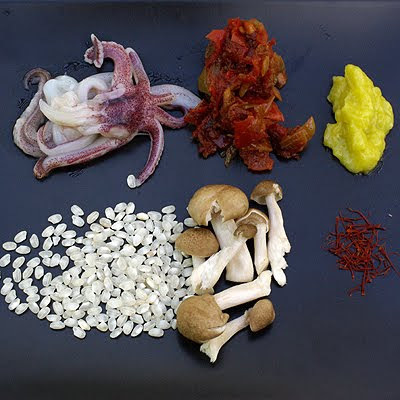 It was rice with mushrooms, cuttlefish and artichokes by José Andrés. You can watch him make the dish here. Although there are several steps to making this dish, it is really not difficult. I made several adaptions based on personal preference and availability. I used squid instead of cuttlefish. I also used brown beech mushrooms and canned artichoke hearts from Trader Joe's. In spring I would choose to use fresh artichokes as the canned ones seem watery and insubstantial. Instead of making a fish stock, I used two cups of clam juice mixed with four cups of water. This was a delicious recipe, one that got rave reviews from my wife. She is quite particular in rating rice dishes and does not usually like risotto. I made the dish expecting to hear bland praise at best. 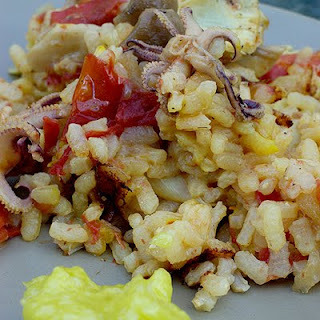 Instead, she positively gushed about the combination of rice, squid and allioli. Thanks for the recipe, Olga. It really is the allioli that brings this dish together. I worried that I wouldn't be able to bring the four ingredients--garlic, lemon juice, salt, and olive oil--together in an emulsified whipped cream-like mass, but it worked wonderfully. I actually used juice from a kalamansi lime instead of lemon juice, but there were no problems. The key seems to be adding the olive oil very slowly to the garlic at first. You can add it much more quickly once you have gotten the process underway. 300 gr (2 cups) Short grain rice (Spanish types Calasparra or Montsant are preferred, but you can choose any other short grain. This kind of rice absorbs flavor very well) – about 75 gr per person ( ½ cup per person) Please read this for more info on suitable rices. If you use fresh artichokes, clean them as shown in the video in tip #7. Cut artichokes in eights. Add some saffron thread to enrich the dish with its flavor and color. Stir a little bit so the rice and the other ingredients get the entire flavor. If you’re using turmeric or yellow coloring, use only 1/4 teaspoon. (1) If you do not have access to a hand blender, you can use a hand mixer (the kind with the two beaters) or a food processor. If you use a food processor, you must double the recipe or the amount will be too little for the blades to catch and emulsify. (2) What happens if the oil and egg separate? Don't throw it out. You can do two things. One is to whisk it and use it as a side sauce for a fish or vegetable. But if you want to rescue the allioli, take 1 tablespoon of lukewarm water in another beaker and start adding to the mix little by little. Blend it again until you create the creamy sauce you wanted. (6) To watch how Jose Andres cooks this dish click here. (8) To tone down the taste when you do it by hand in a mortar, then add an egg yolk. If you want to tone it down in the alternative way use milk or soy milk. Anyway, the best alternative way is the original oil and garlic alone. (9) Allioli must be consumed during the preparation day and preserved in the fridge before using it. (10) For help on conversion on metric to imperial, visit this page. Thai-style sweet chili sauce is a pleasing accompaniment to fried foods such as stuffed chicken wings and spring rolls. The combination of heat and sweetness along with the sharp twang of vinegar in the background really sparks the taste buds. 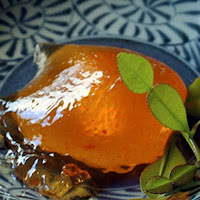 I wanted to come up with a jelly that would make someone think of Southeast Asia when tasting it. I didn't want something that was merely incendiary hot; I wanted something more nuanced. The method and ingredients for making pepper jelly differ little from those for making a Thai-style sweet chili sauce. The basic ingredients are chilies, vinegar, and sugar. Puree, boil, and steep. For the jelly I strained the solids and added pectin to make the liquid jell. The jelly can be served on a cracker with cream cheese or brie. It could also be used as a glaze to grilled pork or chicken. Heated, it liquefies and could be used as a dip for stuffed chicken wings, or crab rangoons that Wandering Chopsticks posted about recently. 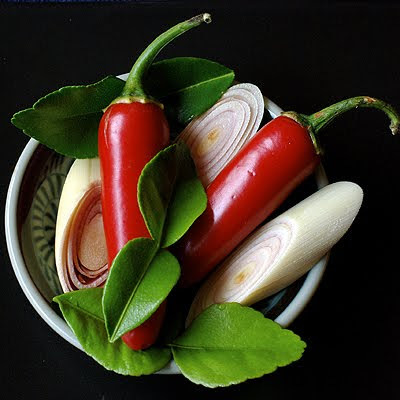 Mix lemongrass slices, lime leaves, chilies, vinegar and sugar in a saucepan. Heat and stir. Bring to a boil, then remove from heat. Using a blender or immersion blender, puree cooled mixture. Let sit for half an hour or so. Strain solids out using a sieve. Bring liquid to a boil and simmer five minutes. Remove from heat and stir in liquid pectin. Pour warm liquid into warm sterilized jars. Process in boiling water for five minutes. Makes 3 half-pint jars. 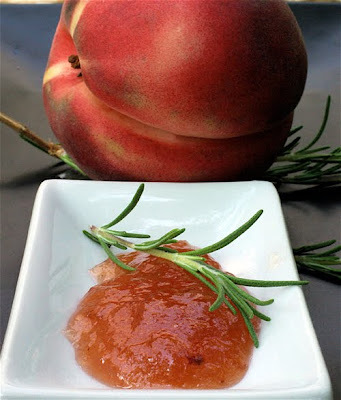 Rosemary and peaches exude the warmth of summer. The juices of a peach drip the long summer days sunlight down your chin. Bruise the leaves of rosemary between your thumb and forefinger and you draw in the hills of Tuscany wavering through heat and memory. Grill peach halves brushed with a sprig of rosemary dipped in a bright, fruity olive oil and you have the perfect dessert, or a sweet and savory side to grilled pork or chicken. They pair with each other with the grace of Astaire and Rogers. Having agreed to take part in Steph Chows Jam Exchange, I had to come up with a jam that I hoped the recipient would enjoy. White peaches are still in season here in northern California, so a peach jam seemed sensible. Tuscan blue rosemary is threatening to overtake much of the back yard, so I thought I might as well make use of that. The recipe I adapted was from the insider trading queen herself, Martha Stewart. As much as her manner annoys me, she does have some good recipes. Here is her recipe. I had to rush the process a little, so I didn't steep the rosemary as long as Martha calls for. I may have used less sugar per portion, too. The rosemary flavor was very pronounced when I tasted the syrup about halfway through the cooking process, so I removed the sprigs at that stage. As much as I like rosemary, I know others don't necessarily share that view. 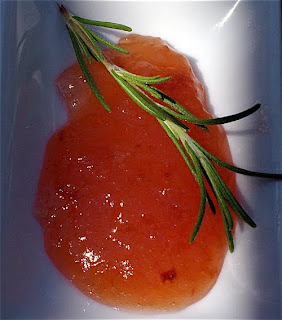 The finished jam does not have a very strong rosemary presence and I wish I had left the sprigs in longer. Mix ingredients together in large pot. Let sit for several hours, stirring occasionally. Bring to a boil and simmer until setting point is reached. Skim foam from surface while mixture simmers. Remove rosemary. I used an immersion blender to puree the chopped peaches after bringing them to a simmer. Pour into warm, sterilized jars and follow procedure for canning in boiling water. Apparently, as the winner of last month's challenge I get to choose the four ingredients and then will select the winner of this month's challenge. Three of the ingredients were from the list here and from suggestions others submitted. I get to add the fourth ingredient. I decided not to include any meat or dairy product so that vegans and vegetarians would feel free to participate. You may of course include the flesh of your choice, or eggs, or cheese, or anything else that strikes your fancy as long as you incorporate the four ingredients in your recipe. So, the four ingredients for this month's challenge are: couscous, fresh chilies, peaches, and rosemary. Couscous was listed on the master ingredient list and Lori suggested Israeli toasted couscous--whichever variant you wish to use is fine. Chilies may be fiery or mild, lots of room to play with there. Tricia suggested peaches and they are at their peak in the northern hemisphere. And I love the aroma and taste of rosemary. You have from now until midnight August 11th to create a recipe, post it on your blog, and send a link to paperchef@gmail.com . You don't need to have a blog to participate; just send an email with the recipe and a photo. A couple days or so after August 12th, the roundup of all the entries will be posted on paperchef.blogspot.com for all to see. I will select a winner from the posted recipes and announce it here on my blog shortly thereafter. For more information, you may want to refer to the rules and regulations post on the paperchef site. There you have it. Good luck and I look forward to viewing all of your wonderful creations.